His 6-month, 5,500-mile journey will highlight the dire state of the world’s oceans. Ben Lecomte is about to jump into the ultimate deep end. 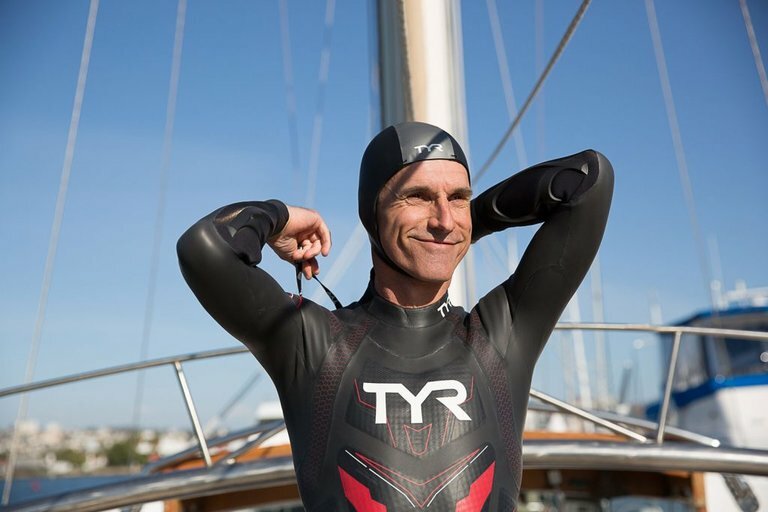 An activist and endurance athlete, Lecomte will embark this weekend on an unprecedented adventure by swimming across the Pacific Ocean — Tokyo to San Francisco. Do the math and that's 5,500 miles. Lecomte will spend the next six months swimming eight hours a day across the planet's biggest and deepest body of water. But Lecomte will be doing a lot more than just swimming. As part of the expedition — dubbed The Swim — Lecomte and his six-person support team will conduct a scientific research projects in biology, oceanography, and medicine in collaboration with research groups, including NASA and the Woods Hole Oceanographic Institution. Lecomte's name might sound familiar. In 1998, he swam across the Atlantic Ocean, Massachusetts to France, with a one-week stopover in the Azores. The Atlantic swim was in support of cancer research, a tribute to his father. Now a naturalized citizen of the United States, the 51-year-old is a veteran long-distance swimmer and advocate for ecological causes. Lecomte has trained for four years in preparation for the expedition. By undertaking such a splashy athletic spectacle, he hopes to raise awareness about humans impacts on the oceans. After departing from Tokyo, Lecomte will be supported by six crew members aboard the Seeker, a sailing yacht that has been customized for the demanding 6-months-long journey. An electric-powered dinghy will trail Lecomte during swimming sessions, providing food and drink and helping in case of emergency. Lecomte plans to swim eight hours a day, averaging 30 nautical miles. After each day of swimming, he will board the Seeker and rest through the night. The following morning, the crew will use GPS technology to drop him back into the exact spot he stopped the day before. Besides typical long-distance swim gear — a wet suit, goggles, snorkel, and fins — Lecomte will wear a wrist-mounted, shark repelling device and a waterproof biometric monitor. Data from the medical monitor will transmit health information to the crew as well as a team of doctors on land. Lecomte will also be outfitted with scientific equipment throughout the journey. A mobile radiation detector will look for and track any contaminants from Japan’s 2011 Fukushima nuclear power plant disaster. The team will also collect data on plastic pollution in the Pacific Ocean. Lecomte will get up close and personal with the issue: Charts indicate he will cross the infamous Great Pacific Garbage Patch. Thanks to the wonders of wireless communication, Lecomte will be the subject of several medical research studies during his swim. Doctors in Texas will track changes to the conditions of Lecomte's heart due to extended extreme exercise. In a promotional video for The Swim, Dr. Benjamin Levine or the Institute of Exercise and Environmental Medicine says Lacomte's journey offers unique insights into heart health. A team of onboard and remote technicians will monitor Lecomte's digestive system and psychological health as the expedition proceeds. They'll even be looking at the effects of gravity on the human body when immersed in water eight hours per day. NASA is hoping the data will help plan future zero-gravity missions in space. You can watch a livestream of Lacomte's journey on YouTube. Videos updates will be published on Seeker.com and on Discovery Go, as well as on Instagram. The project will conclude with a feature-length documentary set for release in 2019.